I started doing contrast baths when my grip training started to ramp up, but this is a good, cheap recovery technique for anytime you’re beating your hands up, be it specific grip training or simply hand balancing. Do this in the evening after you’re done with training for the day. It’s real simple. 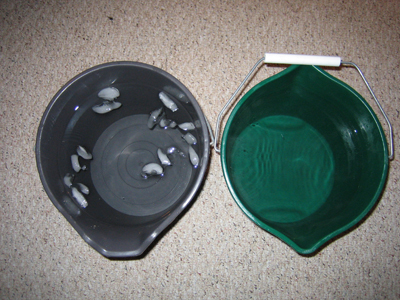 You’ll need two buckets, one in which you’ll put cold water (crack some ice cubes in there too) and one in which you’ll put very warm water (as warm as you can stand, don’t burn yourself). Keep a towel nearby to dry your hands off at the end. �۬Now I like to stick my hands into the cold water first. Submerge them past the wrist and start moving them around. Crack the knuckles if you want, circle the hands, open and close them – just get them moving. Do this for 1-2 minutes, then take your hands out of the cold water and immediately put them into the warm water. Move your hands around again in the bucket for 2-3 minutes. Then pull them out of the warm water, stick them right back into the cold water and repeat the process. You should be able to go back and forth 2-3 times before the waters warm/cool and lose their effect. The contrast in temperatures helps stimulate vasodilation and vasoconstriction in your hands and move blood through them. It’s easy, effective, and your hands will feel much better for it. Great advice. My father also used to take contrast showers, hot shower with a couple of buckets of ice cold water on the side to pour over yourself in between. Feels amazing. There are many talks of the health benefits of hot/cold showers. I think in the very least it makes one mentally tough! Sorry to bother you with this question: I feel awkward with my right thumb, whenever I press or pinch on it I feel pain. Does the contrast baths will help me with it? AHJ is looking for partnerships with blog owners in the health care niche. American Health Journal is a health care web site with a significant library of high quality health care videos. We can offer content exchanges, link exchanges, and exposure to your website. Come message us at our contact form on our website.